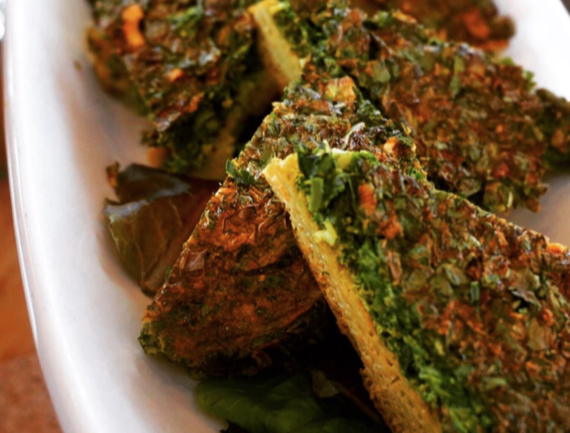 Chef Hoss Zare's Persian frittata or kuku. World-renowned chef Jim Dodge, director of specialty culinary programs at Bon Appétit Management Company has embarked on a new culinary journey to train the food service pioneer's chefs the fundamental techniques and flavors of Persian cooking. 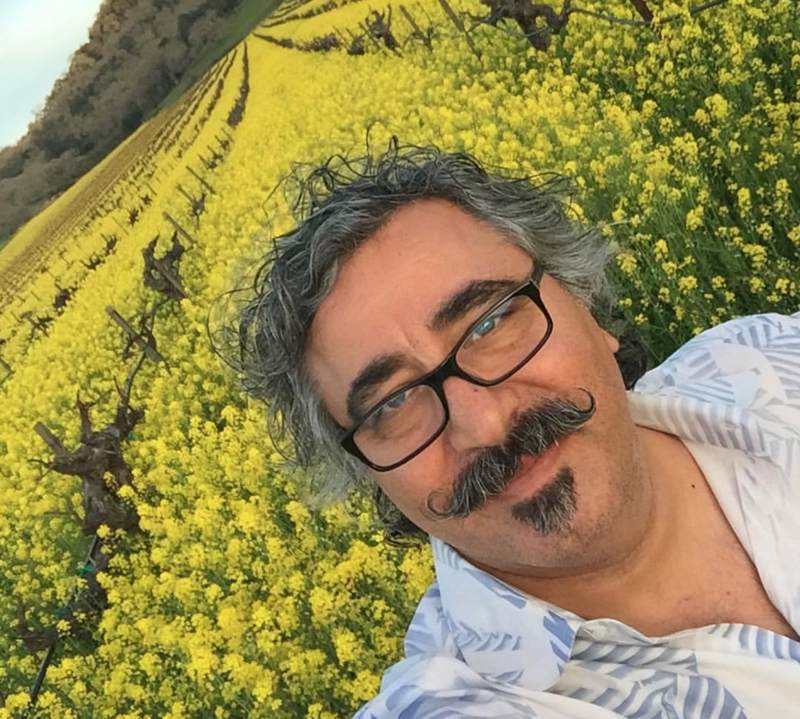 Dodge has teamed up with the celebrated Iranian-American Chef Hoss Zaré, former owner at Fly Trap restaurant in San Francisco, to conduct a comprehensive training program for dozens of Bon Appétit chefs. 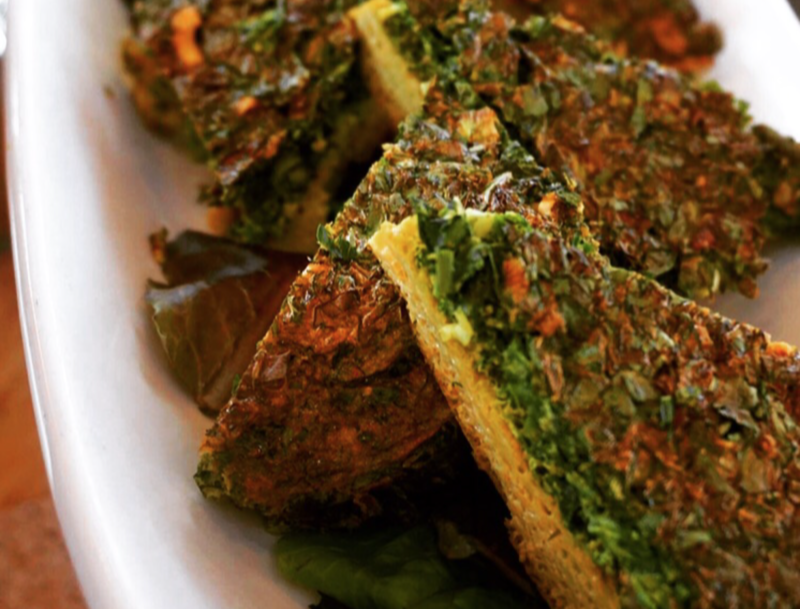 From Persian frittatas with fresh herbs to chicken and pomegranate walnut sauce, the Dodge/Zaré road show from Southern California and Oregon to Baltimore is bringing the fresh aromas and allure of Persian cuisine into the toolkit of passionate chefs around the country. A storyteller at heart, Zaré infuses his Persian Pantry and teachings into some 80 authentic and contemporary recipes full of fresh green herbs, spices, and stews that are indigenous to the diverse regions of Iran. Along the way, chefs are getting a taste of the nourishing aromatic components, balance of flavor, and healthy methods of Persian cooking. The training typically begins with a welcome followed by a demonstration -- dry toasting and grinding spices. Around noon, the food is served and everyone introduces their dishes and discusses their experiences making them. 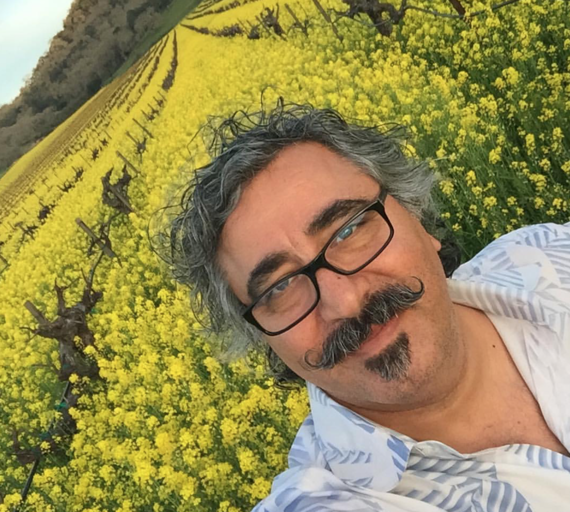 Chef Hoss Zare amidst the mustard fields of Napa, California. One of the keys to Persian cooking is understanding that some foods are considered hot and others cold. But hot and cold don't really refer to the temperature of food or the individual ingredients; they are rather descriptions of inherent properties in food that cause changes in the body. In practice, this means that if you have a health problem that is categorized as "hot", you would eat cold food to counter it. The opposite is also true: if you have a "cold" nature, eating too much cold food can throw you off balance. For instance, chocolate and nuts are hot. So if a person has a rash, they'll immediately be told to hold off on those foods. Coriander and sour plums are considered cold. If a person has a fever, they'll usually be given a coriander-and-plum soup. The importance of rice began during the 16th century when it was being prepared in the royal Safavid court. During this time period, the practice of preparing rice as polow or chelow began. At the same time, the practice of making khoresh (stew) and eating them with rice also became popular. It is said that the practice of preparing these dishes stemmed from the surrounding central Asian cultures that had meshed into Persian society by the 16th century. The treasured component of rice is tahdig, which literally translates to "bottom of the pot." Persians live for tahdig, it's always the first thing to go at parties! There is nothing really to it -- it's just the crispy part of the rice that sticks to your pot, but perfecting it is an art form! You want the rice to have a golden and crispy texture, not burnt. Rose is a common ingredient in many Persian dishes including the frozen rose ice dessert called faloodeh. The most popular types of rose are rosewater and the actual buds or petals that can also be used as garnish. Bread is a staple of the Persian diet. A 19th century physician in the royal court remarked that bread served as an eating utensil, plate, napkin, and even as baking sheets. The first signs of Westernized bread came from Russia to the Northern area of Iran, Gilan, where bread was used for sandwiches. Barbari bread is a thick yet spongy style of bread that is perfect for breakfast, sandwiches, and kebabs. The Persian flatbread known as Barbari has been popular with the chefs. Chef Jim Dodge, together with Bon Appétit's wellness team, has held cuisine-immersion trainings for the past decade. 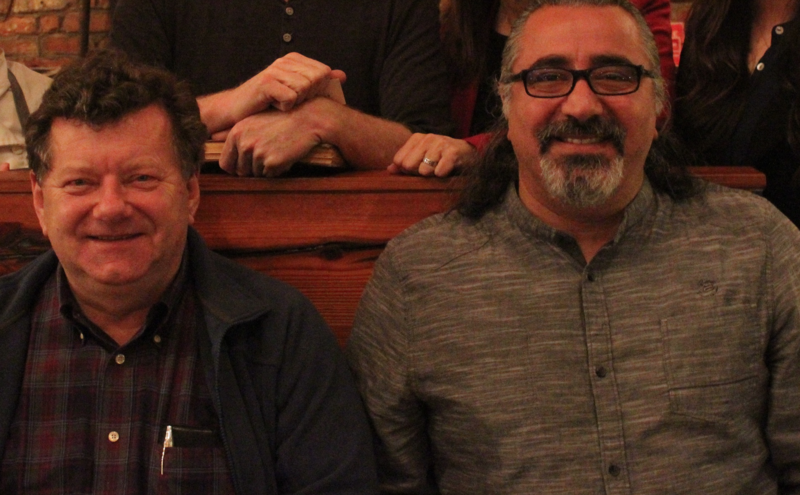 The hands-on Persian training with Chef Hoss Zare, full of culinary anthropology has been well-received by Bon Appétit chefs all over the country. Next stop: Minneapolis and St. Louis! Follow their adventures @ChefZare. 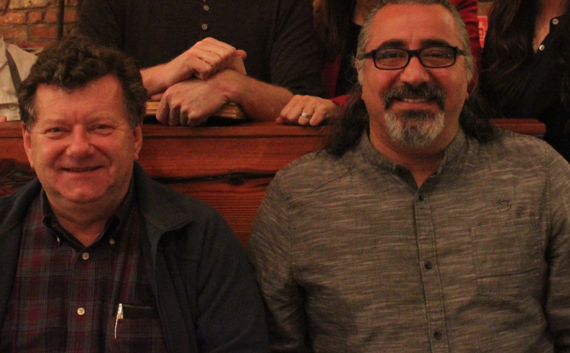 Renowned Pastry Chef Jim Dodge and Chef Hoss Zare at Baltimore's Woodberry Kitchen.